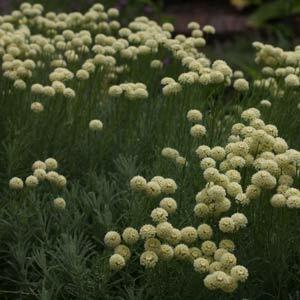 Underused in Australian gardens Santolina are a Sun Loving plant commonly called Lavender Cotton. Best know for the species Santolina chamaecyparissus, an excellent plant for a dry garden, however many other species and named cultivars are worth exploring as well. Naturally growing in dry conditions, often in poor soil, however thriving as a great garden plant under slightly better conditions. Some species are grown for the foliage, however these great little plants can also provide a mass of flowers as well. 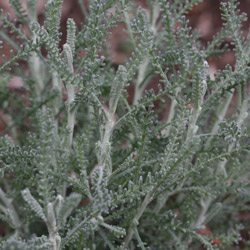 This group of evergreen perennial shrubs are often referred to as Cotton lavender, Santolina are a useful garden plant that cope well with hot dry conditions and will form dense small bushes. 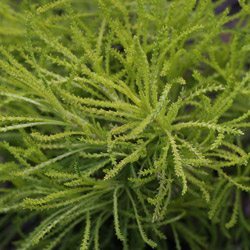 A small flowering shrubs that grow to .5m, Santolina are a dry tolerant plant that prefer full sun. Look for S.rosemarinifolia a yellow flowering Green species and S. chamaecyparissus Var Nana, a grey/silver foliage plant. A number of species are sometimes used in ‘Knot Gardens’ and Boxford International Gardens in Canberra has a fine example. Santolina virens is known as Green Santolina. S neapolitana ‘Edward Bowles’ is a popular ornamental species. S. incana is another available for sale online from participating nurseries. While S. virens is called ‘Green Cotton lavender’ the cultivar, S. virens ‘Lemon Fizz’ comes with bright yellow foliage. Mound forming and growing to 20cm 18″ S. virens ‘Lemon Fizz’ a bright addition to the garden. S. rosmarinifolia is known as the ‘Olive Herb’. The foliage is used for flavouring salads, and yes it tastes like olives.